Build the most modern and engaging courses for your workforce using our new online course builder. Create the best online courses with stylish and engaging course creation tools using our interactive, drag and drop online course builder. There are so many reasons for creating courses quickly and easily in today's workforce. 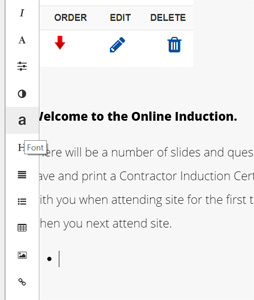 From inductions to learning content, a good online course builder can make all the difference for quick and easy course delivery. Often it can be a struggle to create and maintain course content given the rapid changes in organisations. Keeping materials up to date, compliant, valid with the latest content and creating new content can be extremely time consuming. The last thing you need is complex course building tools that take ages to learn, manage and deliver to learners. Everyone is on mobile devices today from iPads and tablets throught to iPhone and Android devices. Ensuring that your course builder is able to create and deliver content to these devices is extremely important if your user base mostly uses them to view their course content. Ensure content is perfectly optimised for mobile devices and tablets. That it is easy to read and engage on. Our course builder gives you all the options. If you find you need courses fast, there's no better way to start building them then to start using our templates and edit them from there. Pick a course, load the template and edit the slides to personalise and customise specific to your organisation, workforce and requirements. Check out our massive course library right here. With our course library you can get started right away with slide templates on your chosen topic and then edit away from there using our online course builder. Courses range from common workplace topics around safety, working in confined spaces, bullying and harassment through to conduct at work and hazards in the workplace. Using our course builder you can create animated online course content with different affects, transitions and slideshow styles. A drag and drop interface makes it easy to add in text elements, graphics, audio files, embed videos, pick from templates and create online slides how you want. Everything you create using our course builder can be tied in to our AI that allows for users to be analysed and have courses suggested to them based on their skill set. This is a great way to identify training caps in the workplace and ensure everyone is getting suggested and assigned courses that are suitable to their role or skills gaps. Our course builder also has a virtual component where you can embed 360 degree virtual content and have it display on a web browser using our special player. This makes for the highest quality course content and user engagement with truly immersive experiences brought to life using our course builder. Transform your workforce with the most engaging content about your workplace and common workplace topics using virtual features. All you need is a modern smart phone to capture the media, upload and publish away!